Hear ye! Hear ye! At last Vespers, King Adolphoson Sedgwickson III was regrettably forced to behead his Royal Blacksmith due to the Blacksmith's annoying affinity for rude humor. Therefore, this ROYAL DECREE announces a job opening in the field of ROYAL BLACKSMITHERY! This job comes with a base salary of 1150 gold and covers both health and dental. An add-on life-insurance policy is also suggested for those applicants with families, or for those bad manners. To apply for the position, craft four of the items on the King's Craft List. The first subject to do so will be named the new King's Forge to the Royal Court of His Majesty King Adolphoson Sedgwickson III! In King's Forge, players are craftsmen and craftswomen seeking to become the favorite of the King. A variety of dice represent both the currency and the raw materials (metal, wood, gems, and magic) used to craft items from the King's list. In the Gather phase, your dice are used to purchase more dice and dice roll-modifiers. Unused dice are then rolled in the Crafting phase in an attempt to meet the requirements to construct the items on the King's list. An early lead is not a sure path to victory and other players will out-maneuver and out-build you whenever possible. Careful dice management, advance planning, fierce competition, and nail-biting luck will carry you to your new position as the King's Favorite! I think the title says it all. You roll some dice attempt to purchase things whether it be more dice or something from the forge and repeat. I am not a huge fan of this game. 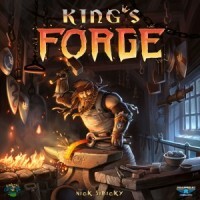 Add a Review for "King’s Forge"